فرج اله پور, محمد, لایقی, محمد, دوست حسینی, کاظم, عدالت, حمیدرضا. (1396). تاثیر رطوبت لایه و پیش گرمادهی با امواج مایکروویو بر خواص فیزیکی و مکانیکی چوب لایه‌ای. مجله صنایع چوب و کاغذ ایران, 8(1), 39-51. محمد فرج اله پور; محمد لایقی; کاظم دوست حسینی; حمیدرضا عدالت. "تاثیر رطوبت لایه و پیش گرمادهی با امواج مایکروویو بر خواص فیزیکی و مکانیکی چوب لایه‌ای". مجله صنایع چوب و کاغذ ایران, 8, 1, 1396, 39-51. فرج اله پور, محمد, لایقی, محمد, دوست حسینی, کاظم, عدالت, حمیدرضا. (1396). 'تاثیر رطوبت لایه و پیش گرمادهی با امواج مایکروویو بر خواص فیزیکی و مکانیکی چوب لایه‌ای', مجله صنایع چوب و کاغذ ایران, 8(1), pp. 39-51. فرج اله پور, محمد, لایقی, محمد, دوست حسینی, کاظم, عدالت, حمیدرضا. تاثیر رطوبت لایه و پیش گرمادهی با امواج مایکروویو بر خواص فیزیکی و مکانیکی چوب لایه‌ای. مجله صنایع چوب و کاغذ ایران, 1396; 8(1): 39-51. در این تحقیق تاثیر رطوبت لایه‌ها و مدت زمان پیش گرمادهی با امواج مایکروویو بر خواص فیزیکی و مکانیکی چوبِ لایه‌ای مورد بررسی قرار گرفت. عوامل متغیر این تحقیق شامل رطوبت لایه‌ها در سه سطح 3، 5و 8 درصد و زمان پیش‌گرمادهی با امواج مایکروویو در سه سطح 0، 120و 180 ثانیه بود. برای ساخت تخته‌های چوب لایه‌ای از 9 لایه‌ی صنوبر به ضخامت 5/2 میلیمتر و چسب فنل فرمالدهید جهت اتصال لایه‌ها استفاده شد. فرکانس و توان مورد استفاده در این تحقیق جهت پیش‌گرمادهی لایه‌ها به ترتیب برابر2450 مگاهرتز و 4000 وات بود. نتایج نشان دادند که با افزایش رطوبت لایه‌ها از 3 به 8 درصد خواص فیزیکی و مکانیکی تخته‌های چوب لایه‌ای کاهش می‌یابند. در مقابل پیش‌گرمادهی با امواج مایکروویو موجب بهبود در خواص شد و با افزایش زمان پیش گرمادهی افزایش در خواص فیزیکی و مکانیکی دیده شد. تاثیر مثبت گرمادهی با امواج مایکروویو در مورد لایه‌ها با رطوبت بالاتر بسیار محسوس‌تر است. Nemli, G., Aydın, I. and Zekovic, E., 2007. Evaluation of some of the properties of particleboard as function of manufacturing parameters. Materials and Design, 28:1169–1176. Doosthosseini, k., 2002. 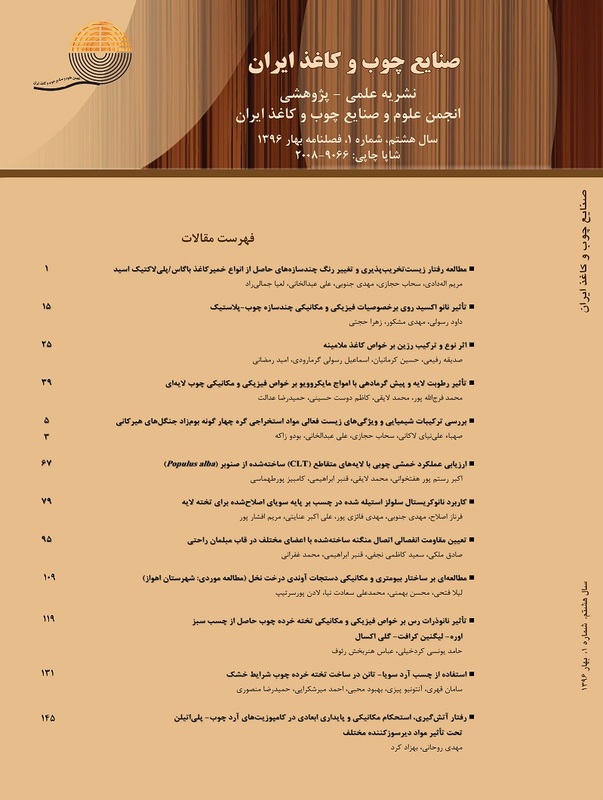 Technology and application of wood composites, 1st edition, tehran university publication, 648 p. (in Persian). Pereira, C., Blanchard, C., Carvalho, L. and Costa, C., 2004. High frequency heating of medium density fiberboard (MDF): theory and experiment. Chemical Engineering Science, 59: 735 – 745. Wu, Z., Furuno, T. and Zhang, B., 1998. Properties of curved laminated veneer lumber made from fast-growing species with radiofrequency heating for use in furniture. Journal of Wood Science, 44:275-281. Antti, A. and Perre, L.P., 1999. A microwave applicator for on line wood drying: Temperature and moisture distribution in wood. Wood Science and Technology, 33:123-138. Thostensen, E.T. and Chou, T., 1999. Microwave processing: fundamentals and applications. Composites: Part A 30:1055–1071. Kangcheng, W., Chenglong, L., Minzhi,C., ,Xiaoyan, Z., Zhenyu, D. and Da, S ., 2015. Development and performance evaluation of a new thermal insulation material from rice straw using high frequency hot-pressing. Energy and Buildings, 87:116–122. Zhou, B. and Avramidis, S., 1999. On the loss factor of wood during radiofrequency heating. Wood Science.Technol, 33(4):299–310. Resnik, J. and Sernek, M., 1997. High-frequency heating of wood with moisture content gradient, Wood Fiber Science, 29(2):264–271. Frihart, C. R., 2005. Handbook of wood chemistry and wood composites: wood adhesion and adhesives. 215-278. Sernek, M., Resnik, J. and Kamke, F., 1999. Penetration of Liquid Urea-Formaldehyde Adhesive into Beech Wood. Wood and fiber science, 31:41-48. Abdul Khalil, H., Nurul Fazita, M., Bhat, A., Jawaid, M. and Nik Fuad, N., 2010. Development and material properties of new hybrid plywood from oil palm biomass. Materials & Design, 31(1):417-42. European Standard, Wood-based panels sampling, cutting and inspection. European standardization Committee, British Standards Institution (BSI), EN 326-1, 1994. European Standard, Wood-based panels Determination of modulus of elasticity in bending and of bending strength. European standardization Committee, British Standards Institution (BSI), EN 310, 1993. European Standard, Particleboards and fiberboards Determination of swelling in thickness after immersion in water. European standardization Committee, British Standards Institution (BSI), EN 317, 1993. European Standard, Laminated Veneer Lumber (LVL) Definitions, classification and specifications. European standardization Committee, British Standards Institution (BSI), EN 14279, 2004. European Standard, Fibreboards Determination of resistance to axial withdrawal of screws. European standardization Committee, British Standards Institution (BSI), EN 320, 1993.